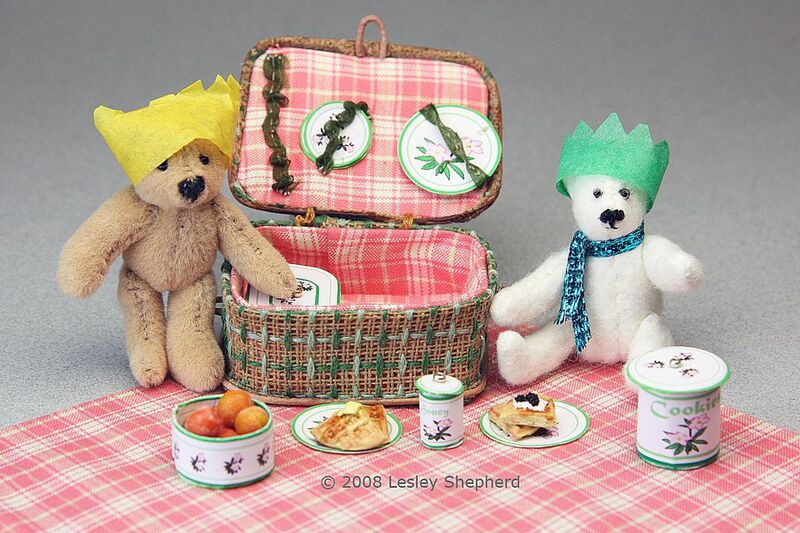 Miniature Bears Picnic with a Dolls House Picnic Basket. Photo ©2008 Lesley Shepherd, Licensed to About.com Inc. This miniature picnic basket in 1:12 dollhouse scale, can be used for a teddy bear's picnic or made larger or smaller to suit your doll's house scene and scale. The basket easily accommodates the printable miniature plates and casserole dishes which are also projects on this site. Although this picnic basket is made with a colored cross weave, you can choose to make your basket out of other materials, including paper or card, or make it from plain needlework canvas. Diagram for the Parts of a Dolls House Miniature Picnic Basket. Photo ©2008 Lesley Shepherd, Licensed to About.com Inc.
Needlework canvas. I used 11 mesh per inch canvas measuring measuring 9 inches by 4 inches. You could also make this basket using card, or a fairly heavy fabric and interlining. Embroidery thread I used three strands of two colors for the woven color work. Leather trim- or drapery cord, or embroidery floss, or thread wrapped wire. I used 1/8 inch leather cord. Co-ordinating lining fabric or paper. I used a piece 6 inches square for the tablecloth, and approximately 9 by 4 inches for the lining. Scraps of ribbon If you want to create holders for cutlery and plates. Fine elastic thread to create elastic ribbons for the plate holders. Card or photo weight paper to attach the fabric for the lining. Basket former- a small piece of wood, 1 ½ inches by 2 inches , by 2 inches with rounded corners, or a suitable sized tin, or a piece of Styrofoam the same dimensions as the wood. This is not essential but it is very helpful. Diagram of Parts The scale diagram for the parts of the picnic basket is available as a pdf (acrobat reader) file. Weaving embroidery thread through needlework canvas to create miniature wicker patterns. Photo ©2008 Lesley Shepherd, Licensed to About.com Inc.
Use three strands of embroidery thread to form a woven pattern in your needlework canvas. I alternated between a dark and a light green, chosen to match the Christmas Rose Plate pattern leaving a blank row between each color, then forming the same pattern in the opposite direction..
Weave enough of the canvas that you will have decorated canvas for a top and bottom, approximately 2 inches by 1 1/2 inches each, and a side piece, approximately 1 1/2 inches by 7 1/2 inches. Do not cut the pieces out until you have woven your pattern. If you will be using a different fabric, you can ignore this step. If your chosen fabric is not as stiff as needlework canvas, stiffen it by backing it with iron on interfacing. Shape needlework canvas over a mold to make the lid of a dolls house picnic basket. Photo ©2008 Lesley Shepherd, Licensed to About.com Inc. Using your wooden form or a tin (as shown in the photo), cut the top and bottom of your picnic basket from the woven material, leaving about 1/4 inch of extra fabric on all sides. Dampen the material and shape the top and bottom of your basket over your chosen mold. Needlework canvas has a lot of sizing which loosens when dampened, allowing you to shape the canvas over a form. Hold the canvas pieces in place with a rubber band, or a piece of string, until they dry. Carefully remove the shaped canvas pieces from the form. Shape the sides of a miniature dolls house picnic basket around a mold. Photo ©2008 Lesley Shepherd, Licensed to About.com Inc.
Cut the side piece of canvas larger than the pattern, and carefully bend the top edge over 1/8 to ¼ inch, following along a line of the canvas (or the grain of your fabric.) Glue this top fold to the inside of the basket side. When the side is dry, remove it from the form, and glue the folded end over the other end to form the completed basket side. When the piece has dried and is glued into an oblong shape, turn up the bottom end of the side by about ¼ inch, towards the inside. Use scraps of leather trim, ribbon, or cord to make handles in the centre of the ends of your basket. Glue these in place and leave to dry. Glue trim around the edge of the lid of a miniature dolls house picnic basket, then trim away the waste canvas. Photo ©2008 Lesley Shepherd, Licensed to About.com Inc.
Beginning at the centre of the back edge, while the dried top of the basket is still sitting on your mold, draw a small line of glue about 1/8 inch down from the top of the basket on the side overhang. Completely encircle the lid with the trim. Cut the trim to meet at the back and set aside to dry. Repeat with the basket bottom. When the trim is glued in place and everything is dry, use small sharp scissors to trim the excess fabric away from the bottom of the trim, leaving the trim and the basket top in one piece. Cut as close to the trim as you can. Add a loop to the top front edge to act as a basket closure if you wish. Glue fabric to card to create linings for a miniature dolls house picnic basket. Photo ©2008 Lesley Shepherd, Licensed to About.com Inc.
Cut pieces of card the same shape as the top and the bottom of the basket, and the same size as the side of the folded basket edge. Trim these pieces slightly smaller and test fit them to make sure they will fit inside the top and bottom of the basket, and inside the basket side, with a bit of space between the trim and the walls/top/bottom of the basket. Cut pieces of lining fabric ¼ inch larger on all sides than the pieces of card you have just cut. Cut small pieces of ribbon ½ inch longer than you will need to cross over the plates. Fold a tiny hem on each end, and sew them in place on the lining fabric for the top of the basket. When you have the ribbons sewn to the lining fabric, (make sure the plates will fit side by side in the space you have allowed), add the elastic. Sew a thin clear elastic thread through the centre of each ribbon section, gathering the ribbon with the elastic as you go. Tie off the elastic securely on the back of the lining fabric. When the top lining has the ribbons sewn in place and the elastic added, put some glue on the back edges of the piece of card for the top of the basket, and carefully fold the fabric over the edge, centering the fabric on the card, and starting the glue process in all four corners before carefully stretching and gluing the sides. Set aside to dry. Glue the bottom lining to the card the same way. Set aside to dry. Glue the base to the sides of the basket. The top is held on with two sets of hinging stitches which you can see on the back of this basket. Photo ©2008 Lesley Shepherd, Licensed to About.com Inc. When the basket outer sections are dry, fit the base of the basket onto the folded side edge of the basket, so that the side edge fits inside the bottom trim. Run a bead of glue around the inside edge of the bottom, and glue the folded edge of the side inside the basket to the base. Set aside to dry. Fit the top onto the side of the basket, so that the trim overlaps the side of the basket. Make sure the back of the lid trim is lined up with the back of the basket. When the lid is fitted in place, use two strands of embroidery thread to sew the lid to the basket and form hinges. Do this on either side of the back side seam, sewing just over the trim on the top of the basket, and only one or two threads down into the side. Make these stitches loose enough that the basket lid will hinge easily. Tie the hinge stitches off inside the basket side. Fit and glue the miniature lining to the inside of the dolls house picnic basket lid. Photo ©2007 Lesley Shepherd, Licensed to About.com Inc. When the linings are dry, and the outer side is firmly glued to the outer bottom of the basket, put a small amount of glue on the back of the card and glue the top lining to the inside top of the basket. Make sure the glue does not ooze out through the top of the basket! Place the side lining into the basket, then press the bottom lining into place. You do not need to glue the bottom lining, although you may if you wish. A Miniature Dolls House Picnic Basket with a Fitted Lining. Photo ©2008 Lesley Shepherd, Licensed to About.com Inc.
Sew a bead on the front top edge of the basket side to catch in the loop you made (or add a loop now!). Fit the plates into the top of the basket. The basket dimensions should allow you to use items from the Christmas rose set of canisters and casseroles as containers for inside the basket. Cut a 6 inch square of the lining fabric, and hem or fuse the edges to make a matching picnic tablecloth.